Sony and Apple are the key to promoting micro-LED displays on the market, but the two have diverged in display developments. The Japanese company is making large micro-LED displays, and Apple small displays, but why have both chosen micro-LEDs? Sony has released its micro-LED display product, but the market is yet to see the delayed product from micro-LED transfer specialist Luxvue, which was acquired by Apple in 2014. Apple is the poster child for OLEDs in 2016, even Sony has been active in the field. Sony released its second generation micro-LED product Crystal series CLEDISTM at Infocomm that took place in June 2016. Crystal LED Display was silent about its new product launch for nearly four years, and there were market rumors that OLED would replace LCD displays. Micro-LEDs quiet emergence on the market has placed it under the media lime light. 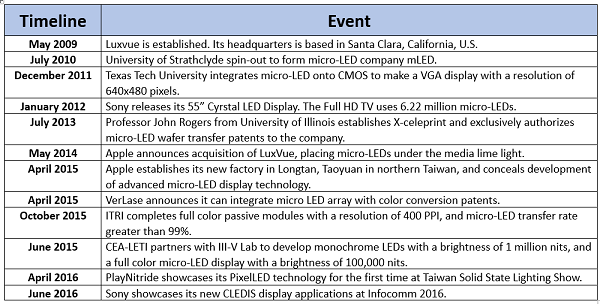 The term micro-LED emerged as early as 2000, when Cree applied for the patent “Micro-led arrays with enhanced light extraction,” and related research papers appeared soon afterwards. However, micro-LED is still purely academic. Research institutes in academia have continued to invest in micro-LED research, such as Illinois University, Strathclyde University and Texas Tech University. In Asia universities including Hong Kong University of Science and Technology, Taiwanese universities National Chiao Tung University (NCTU) and National Tsing Hua University (NTHU) have all announced their research results, and some of the research teams entered the industry through spin-offs, commercialization of products or joining companies. Professor John Rogers from University of Illinois is one of the leading figures in the micro-LED field, the research team’s novel transfer printing technology was spin-out to establish Smprius in 2006. By 2013, he founded X-celeprint and authorized micro-transfer-printing technology (µTP) to the company. Strathclyde University micro-LED research team was also spun-off into mLED in 2010, prioritizing micro-LED display applications for close range viewing. Academia, display manufacturers and panel makers have been secretly investing in micro-LED R&D, but two large consumer electronic giants Apple and Sony are the key companies that spurred the commercialization of the product. 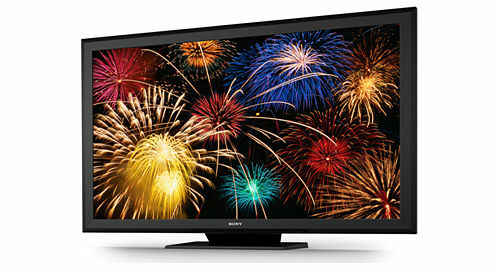 Sony launched its Crystal LED Display at CES in 2012, pioneering micro-LED applications in consumer electronics. The micro-LED TV appearance is similar to the average LED display, but was the most expensive and advanced display technology at the time. After igniting market attention, Sony’s latest release did not emerge till four years later. The new display follows the Crystal series naming process, but became the more elaborate Crystal LED Integrated Structure (CLEDIS), the company is no longer providing prototypes, but aims to mass produce the new TVs by 2017. In contrast to Sony’s market positioning in the large display market, Apple is focused on small screen devices. After it acquired LuxVue in 2014, market rumors suggested micro-LED display applications in iPhones, iPads, and Apple Watches. No one knows what Apple is hiding up its sleeve. However, micro-LEDs properties, Luxvue’s patents, and Apple’s product strategies suggest wearables will be the first generation application. It is rumored the Apple’s first micro-LED wearable devices would hit the market in 2017, but a more realistic time line is set in 2018-2019. How come iPhones are not the first micro-LED application sector? While it might not be the first application, it is definitely the Cupertino company’s end goal. Some observations can be made on Apple and Sony’s market deployment strategy, the two companies implemented completely different strategies when commercializing products. Yet, both companies need to overcome the same challenges in backlight applications-Pixel Per Inch (PPI) and pixel volume. There is a high relation between PPI and LED size (the larger the PPI the smaller the LED), pixels also directly affects the end product yield rates. Miniaturization of LEDs to micron size, precise transfer of the micro-LEDs onto backlight devices, smaller driver sizes, and mass transfer of large number of small LEDs naturally increases the technology threshold. Sony was able to quickly commercialize its products because it chose a large display with relatively low PPI, such as 55” TVs with 1080 pixel resolution that took into account technology limitations. A Crystal LED Display has 40 PPI, the theoretical LED size can reach several hundred microns, which ensures the LED chip and SMD LED package are both achievable. The difficulty is bonding 6.22 million LEDs on a FHD (1920x 1080 resolution) TV, which the technology back in 2012 was incapable of achieving. Time for production and yield rates were also another issue. Disregarding cost issues, the Japanese consumer electronics giant could make the TV, but it would have been unaffordable for most consumers. So it was not plausible. Hence, Sony made considerable adjustments in its second generation CLEDIS indoor LED displays. The company reduced its PPI to 15, and after four years of making micro-LEDs it overcame size issues. CLEDIS light emitting surface (LES) takes up less than 1% of space in the panel, and a single LED is about 55 microns (μm) in size. 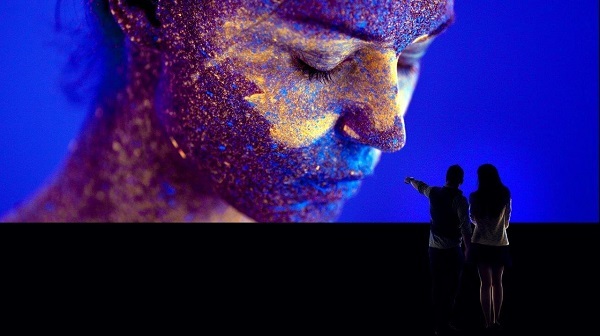 Sony’s approach is very pragmatic, it chose a “connective module” concept, where a single panel uses about 345,600 micro-LEDs, which is less than 6% of the 6.22 million LEDs in its last generation product. The company was able to efficiently raise the displays throughput, which assisted Sony in commercializing micro-LEDs speedily. Apple is directly targeting wearable devices with a PPI of 200-300 PPI, where 55μm sized micro-LEDs are unsuitable. Micro-LED trends in wearables is dipping to below 20μm, making wearables very accessible. Another highlight and advantage of wearables is its “small displays”. Fewer pixels are required for small displays for the same PPI applications, for instance a 38 mm Apple Watch might have a PPI of 3 million, but has in total 92,480 pixels. If you calculate that into RGB LEDs it is 277,440 pixels, less than a single Sony CLEDIS module. For micro-LED to enter the consumer market, it has to cautiously choose between the limitations of PPI and pixels. Displays and wearables both have high brightness demands, while as wearables can benefit from micro-LED’s energy saving features. This would solve the pain-point of low battery endurance in many wearable devices, moreover, pixels for the two types of applications uses a single set are fairly low. The company has an opportunity to lower micro-LED display manufacturing costs. In comparison, smartphones and TVs use a lot of pixels, especially in 4K applications, which requires more than 25 million LEDs, which is unideal for commercialization. Overall, Apple and Sony are specializing in respectively large and small sized displays. While this article does not delve into the real potential of micro LEDs, it gives us room to reflect and assess why it has been able to attract large consumer electronic companies to invest in the technology.